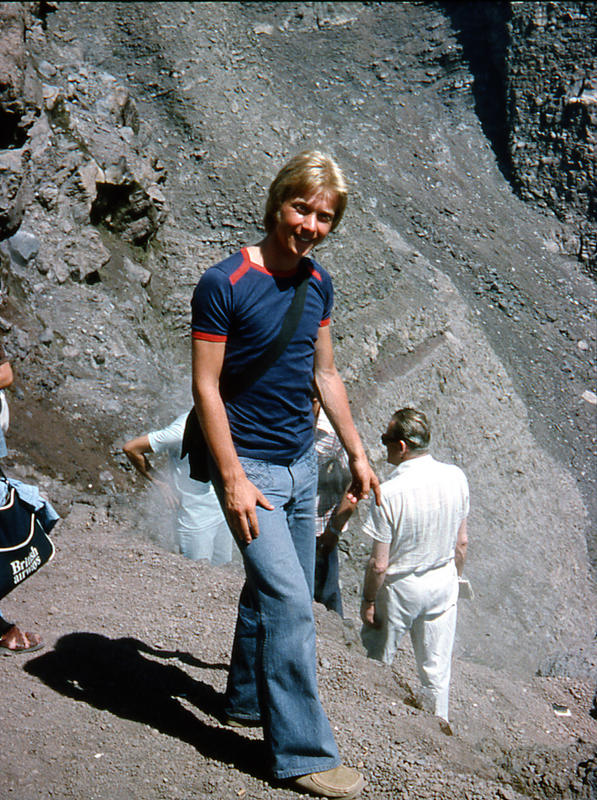 On holiday in Sorrento, Itlay in June 1976 I took a half day trip to nearby Mount Vesuvius which is an active stratovolcano situated to the south-east of Naples. I am being deliberately specific here because what that means geologically is that it is a tall, conical shaped volcano composed of many layers of hardened lava and volcanic ash laid down over the centuries by all of the many previous eruptions. It is in fact the only volcano on the European mainland to have erupted within the last hundred years and that was in 1944 when it destroyed a handful of communities on the lower slopes and an entire United States bomber squadron, which makes you wonder why they didn’t just take off and go somewhere else! Away from mainland Europe, the Iceland volcano Eyjafjallajökull erupted in 2010 and Mount Etna on the Italian island of Sicily became active again as recently as 2013. Even eggheads find it difficult to be absolutely precise about this but scientists think that Vesuvius formed about twenty-five thousand years ago and today the volcano is rated as one of the most dangerous in the world – not because of its size but because of the proximity of millions of people living close by and if it was to go off again with a similar eruption to the one that destroyed Pompeii in 79 A.D. then it is estimated that it could displace up to three million people who live in and around the city of Naples. The volcano has a major eruption cycle of about two thousand years so the next eruption is dangerously imminent. The Italian Government and the City of Naples have emergency evacuation plans in place that would take nearly three weeks to evacuate the entire population to other parts of the country but as Pompeii was destroyed in less than three days or so they might want to work on speeding that up a bit. Mind you, if you think Vesuvius is potentially dangerous then close by to the west of Naples and under the sea is the Campi Flegrei caldera which is a super volcano of potentially immense power. 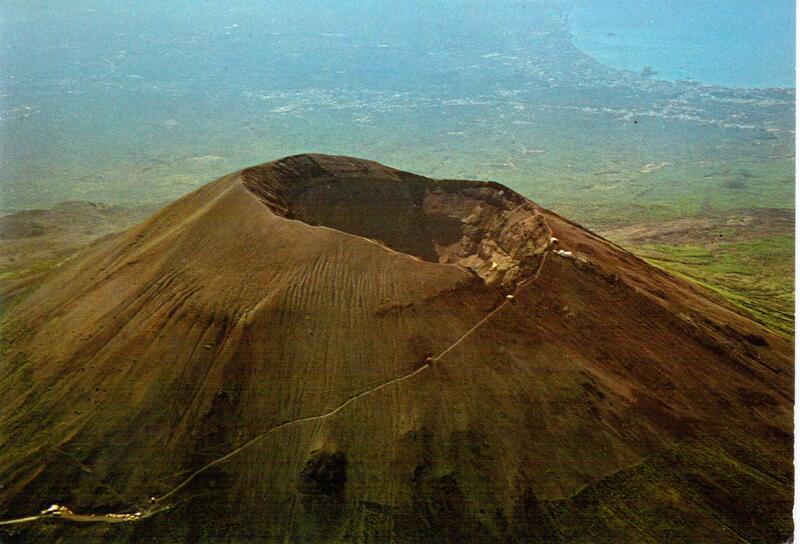 An eruption here would not just obliterate Naples it would have the potential to destroy all of Europe and beyond. In an eruption here the surface of the earth would swell and crack and a series of small eruptions would cause the four-mile-wide caldera floor to collapse into the larger magma reservoir, which would in turn push more magma to the surface. The last time the ground gave way like this almost forty thousand years ago when the caldera was formed, it created the cliffs that the town of Sorrento stands on now, volcanic deposits over one hundred metres deep. If the same kind of eruption happened today, this part of Italy could cease to exist and the ash clouds would blot out the sun and lower the earth’s temperature by several degrees. Life in Europe as we know it would end. It would lose livestock, crops and three-quarters of plant species, plunging the continent into a new dark age of rioting, starvation and perpetual winter. The threat is imminent because the land here has raised three metres in the last fifty years and the area at the epicentre of the swelling has seen whole streets of houses crumble and collapse. The last time the ground rose like this (between 1430 and 1538) there was an eruption that caused the formation of a new volcano. My advice to people living in Naples is to urgently check house insurance cover. Many buildings exist ludicrously close to the summit in what is rather appropriately called the red zone and there are ongoing efforts being made to reduce the population living there by demolishing illegally constructed buildings, establishing a National Park around the upper slopes of the mountain to prevent the construction of any further buildings and by offering a financial incentive of €35,000 to families who are prepared to move away. 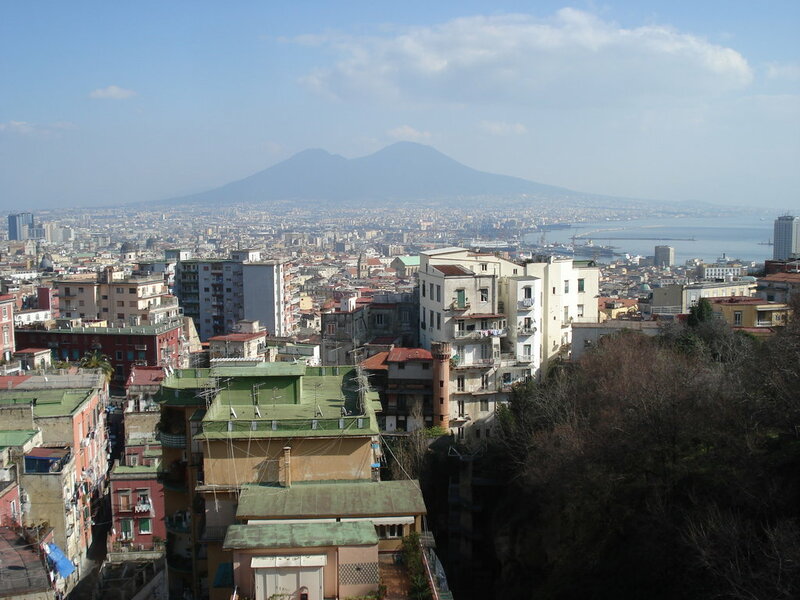 In 1976 it was twenty years before the creation of the National Park and the route up the mountain was via a narrow, steep, winding road through some of the poorest residential areas in Naples. These were people who have chosen to live in run-down houses and shacks, many of which still had evidence of the damage inflicted by the 1944 eruption. They live in the potential danger zone making the most out of the highly fertile volcanic earth to make a living out of growing fruit and vegetables and selling these at local street markets. As the bus negotiated the black lava ribs of the mountain spilling from the top of the volcano the coach wheezed it’s way slowly up the narrow road and around the hairpin bends to a coach park about three hundred metres from the top of the one thousand, three hundred metre high crater. To the dismay of some on board, this was as far as it could go but there was still a considerable way to go up a dusty path of loose volcanic ash and clinker that was like walking on glass marbles so it was a good job that we had taken the pre-excursion advice to wear stout shoes and suitable clothing. The track would almost certainly not have met current European health and safety regulations because there was very little to stop careless people slipping and falling over the edge and tumbling down the mountain side because every so often the track had slipped away down a massive vertical drop and occasionally had been propped up with a few bits of insufficient timber held together with scraps of rope. I understand that it is a lot safer now however. It took about half-an-hour to reach the top and that wasn’t much safer either with a path with a potential vertical fall into the six hundred and fifty metre wide torn and ragged crater if you didn’t keep your wits about you. It was worth the climb however because it was a clear day and the views from the top were simply stunning. To the west was concrete Naples laid out before us and beyond that the Bay and then the Thyrrenian Sea liberally punctuated by tiny islands and islets, which looked as though they were floating on the water like precious jewels set in a priceless bracelet. To the east was the countryside and the vineyards of the region of Campania and the mid morning sun shone brightly on both land and sea below us. 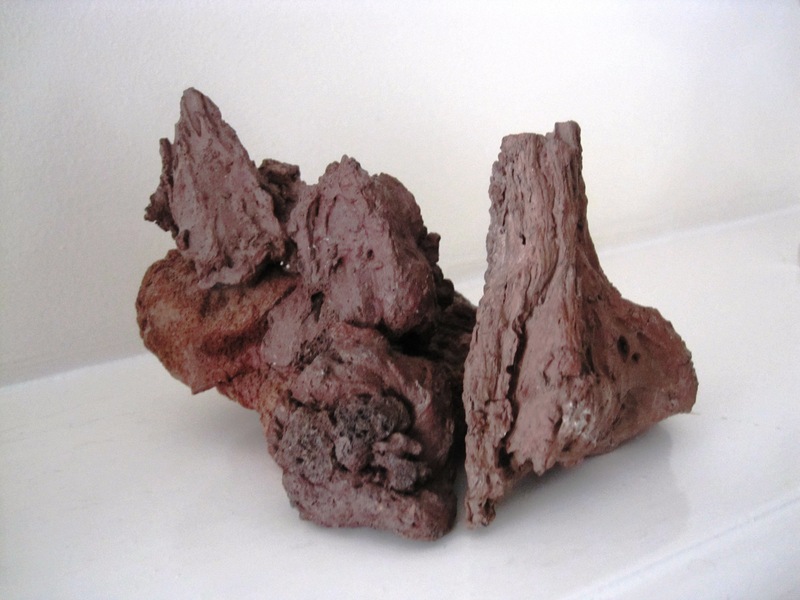 The path around the crater was made of the same ash and pumice and on the way around, and I am not sure that I should have done, I collected some pieces of curiously shaped lava that caught my eye and put them in my pocket and I still have these on show at home even today. Apart from the enormous views there wasn’t really a great deal else to see at the top except for the great yawning crater and a big hole full of rocks waiting to blow up again some time soon. I suppose the point of going to the top of Vesuvius is simply to say you have been there and not because there is anything special to see. In the sunshine the colours however were fascinating, the rocks were black, brown, purple and umber with a sulphurous yellow crust like fine filigree lace and all over there was vivid green copper oxide and hardy mosses ferociously clinging on to life in a highly improbable location. 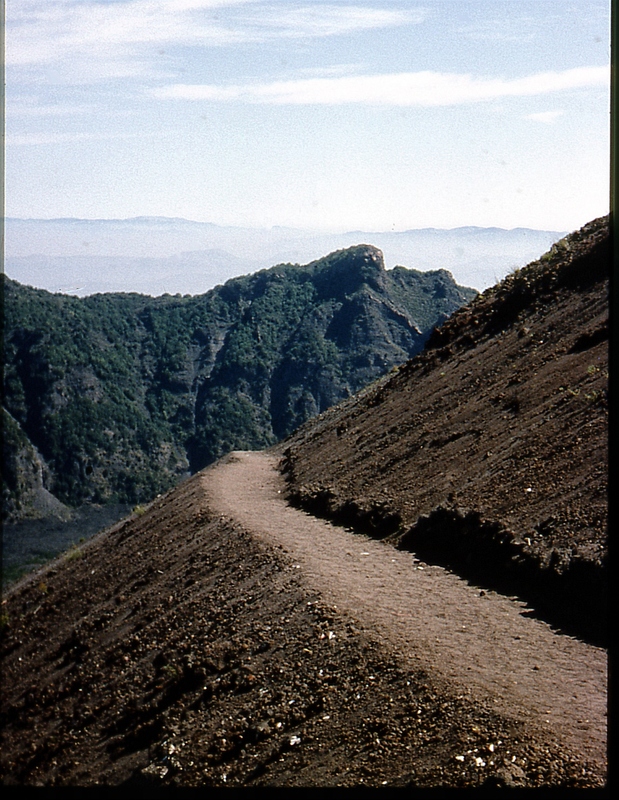 In 1976 it was possible to walk down into the crater by negotiating a precarious track where there were little wisps of smoke belching from a concealed fissure and every so often a smell of sulphur and a little mist of steam drifting across the path just to remind us that this was a living and active volcano. At the top an old man demonstrated how hot the rocks were by lighting a cigarette by bending down and igniting it on the rocks. I think he must have got through a lot of cigarettes in a day and we were all impressed with this and left a small contribution in his collection pot but I have always wondered subsequently if it was some sort of trick. Visitors are not permitted to walk into the crater any more because in 2003 someone slipped, fell inside and died so it was declared dangerous and roped off to stop people straying too far inside. With a final look back to make sure we really hadn’t missed anything we followed the perilous path back to the coach park and once everyone was back we returned to Sorrento and an afternoon of swimming pool routine and ice cream at our favourite café. 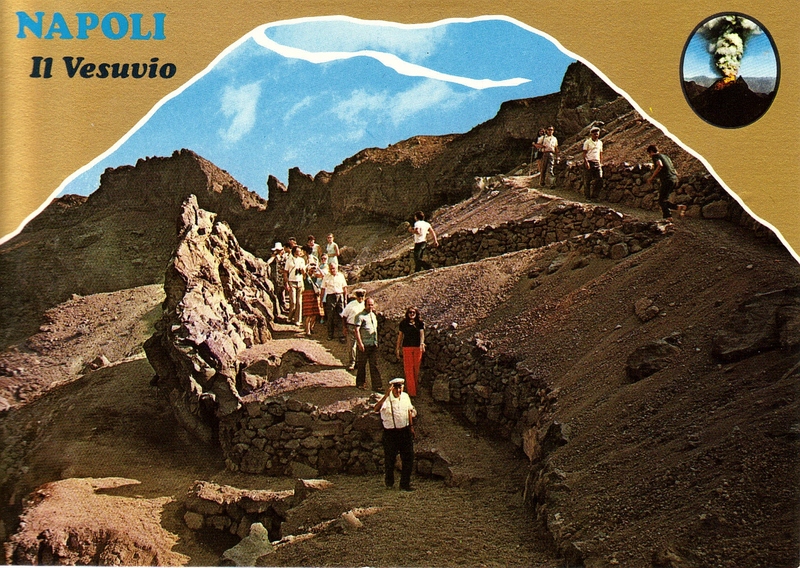 This entry was posted in Europe, History, Italy, Natural Environment, Postcards, Travel, World Heritage and tagged Campania, Herculaneum, Italy, Mark Twain Vesuvius, Naples, Pompeii, Sorrento, Vesuvio, Vesuvius, Vesuvius 1944, Vesuvius 79 AD, Vesuvius Disaster, Vesuvius Eruption, Vesuvius National Park, Vesuvius Postcards, Vesuvius red zone, Volcano. Bookmark the permalink. I’ve always wanted to do this, would you recommend if I only have one day in Naples or better to see other sites? Only 1 day? Probably better to stay in Naples and save Vesuvius for another visit! It would be interesting to know how many people around the world live in danger because of volcanoes. I wouldn’t want to live near one. But sometimes, where we choose to live follows no logic. For example, Californians continue to build mansions on cliffs overlooking the Pacific, and then are surprised when they slide into the ocean. Same where I live on the east coast of England and when it happens they all start complaining that the government or the local council should do something about it! It beats me just what they think they can do now that Canute failed to manage a thousand years ago or so! Very good story, Andrew, and impressive photos. In two weeks I will find myself there too, but what to tell to my readers after you? 🙂 OK, I’ll write about Herculaneum. 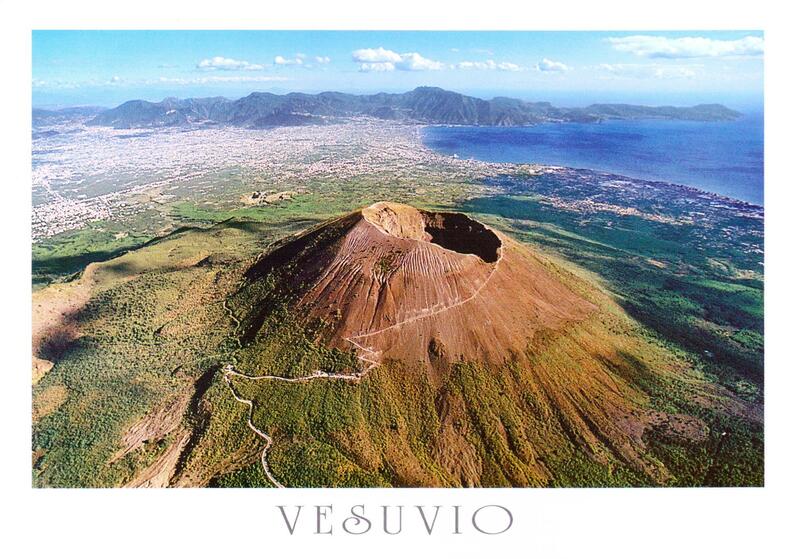 I hope you will go to the top of Vesuvius Victor? You will like Herculaneum and I look forward to reading your story! I don’t think so. Our plan includes Herculaneum and Pompei only. My piece of advice – Make sure that you get an official guide! Yes, they are cheaper but less knowledgeable and best avoided. I have always been fascinated by craters and their precarious perils. I’ve always been drawn into the mystique of volcanoes. Very interesting post. It is amazing how life goes on under threat of disaster, and one can only hope that nature stays calm. Great post Andrew. We are headed to Italy this fall to cycle but beforehand are spending some time in this area. I can already see it won’t be enough to take in everything. It was a good day out, that’s for sure. Thanks for reading! Hopefully the technology exists to get some warning time? Great article, you should write a book about the Armageddon you describe. 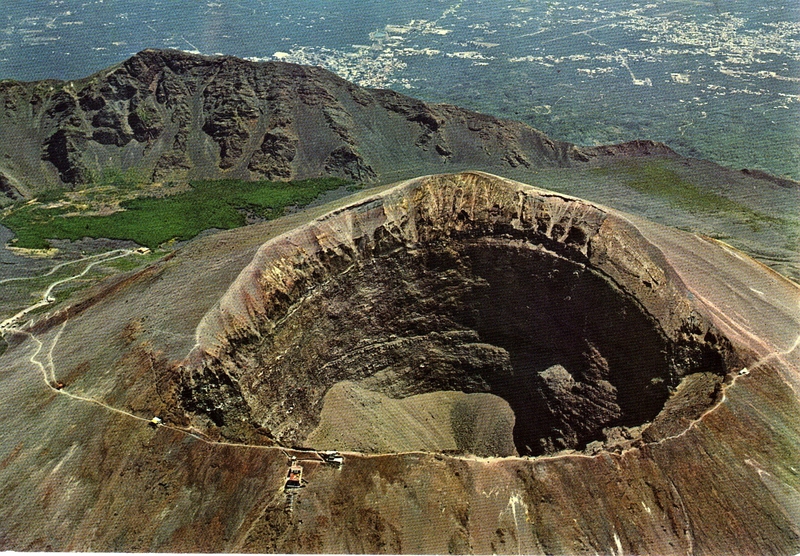 I went to Vesuvius in Sept 2001 – baking at see level and freezing up there. That was the year that Aetna erupted but by the time we got to Sicily it was only smoking. The closest that I have got to an active volcano was in Iceland. Andrew, I love your travel pics and adventures. Keep them coming. Thanks for sharing. It is worth the effort if you go back – fabulous views! My daughter brought me back a piece of pumice from the top. She only just got there because of her asthma being affected by the fumes. It is rather smoky up there. With regards to the pumice I was worried that it might be regarded as stealing as some sort of environmental crime but on reflection there is sure to be a lot more sometime soon! Nice programme on TV about Pompeii last night, did you see it? Thanks for the trip, Andrew. As usual it was full of interesting facts that make your post so much more than just a quick travel post. I really liked it. Thanks John. Interesting that Volcanoes in Australia are mostly dormant but in New Zealand they can be worryingly active. I have ground my teeth down a quarter inch reading this post. Though it’s riveting and I am safe sitting waayy back here, I can’t begin to think of driving of climbing up there. Eke. Too scary for me. Good for YOU. The reward is a truly stunning view in all directions! I’m sure that is true. My loss. So, I’m wondering with Vesuvius and the Campi Flegrei caldera as your neighbours, ready to party hardy…rents must be pretty cheap, eh? Maybe, if so, I might drop in and wait for the party. There will be fireworks for sure! Historical accounts of the death and destruction caused by Mt. Vesuvius catching people off guard 2000 years back are pretty vivid. Found your article an informative update on a “historical figure”. 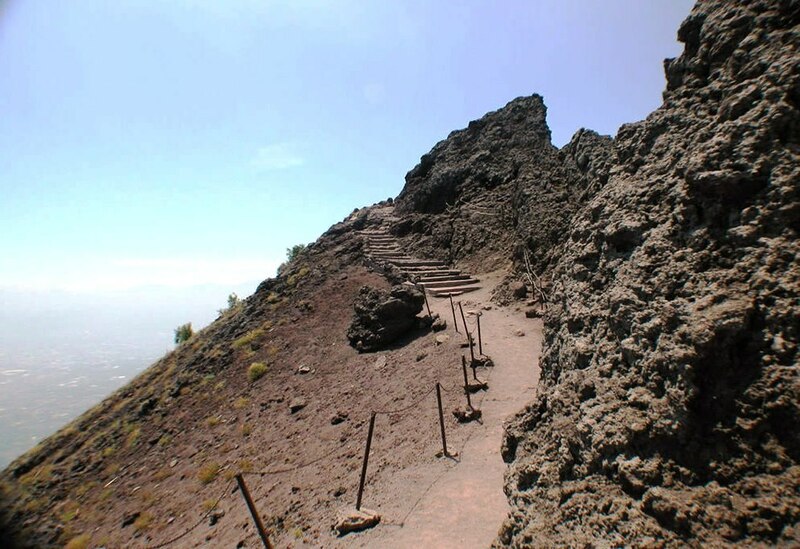 And great pix of the caldera.. I wouldn’t live there, that’s for sure! Thanks for dropping by. Dang authorities, always making things safe for this or that idiot who isn’t smart enough to be careful and stay alive. Ah, for the good ole days of demise of the stupid. Now, we keep them safe, and how do they repay us? By multiplying like rabbits! That walk and visit to the crater looks like something I would have enjoyed. It was good that you could get down really close to the edge. Just common sense required to stay safe! I can’t believe what I read, I didn’t know you could go into the crater before! That must have been such an interesting experience! It was a good day out, I didn’t go back this time because of all of the new restrictions. Thanks for stopping by. Flares! Flares! I’m going for a lie down! I still have them somewhere, waiting for them to come back into fashion. Fashion??? A mate of mine who recently passed away used to wear a kaftan! He thought that was fashion too, he was very dedicated! I never had a kaftan but I confess to tank tops and clogs! Never slim enough for a tank top. Clogs? Went to school in ‘em! and took a bag of gravel for lunch no doubt! Gravel? I think you mean beach pebbles and a seaweed soup! It wasn’t so difficult at 22! Great post with nice information. We have visted it. Our guide told fantastic stories about it. It makes a good morning trip from Naples, thanks for stopping by!